I can’t find a way to talk about Fluxe ($0.99) without talking about Tetris, a fact that hopefully won’t bring down the wrath of The Tetris Company. Fluxe isn’t a clone, it doesn’t use the same shapes and it isn’t even all that similar, but it stands on the shoulders of the giant and plays with expectations built up over the last three decades. You may be familiar with that long column that shapes fall into, and those shapes made up of little squares that just keep falling. In Fluxe, you don’t control the falling, you control the shapes. Your game is outside the column, in a jumble of pieces that need to be turned into lines on the other side of the screen. Imagine yourself as Tetris’s benevolent master, dropping the pieces down only because you really, really want the player to succeed. 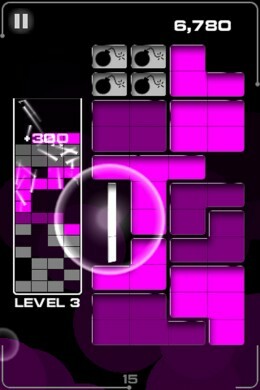 The shapes Fluxe offers you are a long way away from Tetris’s tidy little tetrominos. A little corner or an extended “T" shape are the cleanest shapes you can hope for—more likely, you’ll be working with misshapen squares with extra pieces jutting out, awkward “Y" shapes, and other completely non-compliant elements. The pieces you’re working with come from the ‘touch well’ and when you tap them, they drop into the ‘drop well.’ They drop in the same horizontal position they were already in, so you can’t shift a handy corner piece from the left side to the right if that’s where you need it. Fluxe takes slightly more creative thinking than that. The holes left behind in the touch well get filled with new pieces on a regular basis, but they have to be filled with pieces that fit. Fluxe is almost aggressively rigid. The little squares left behind after a line is matched don’t cascade, they just drop into the nearest semi-supported position. This makes clearing away your mistakes next to impossible. And if you finally manage to use an awful, awkward shape, you’d better use a few others before the next refresh of the touch well or you’ll end up with the same problem you started with. There are a few concessions. You get a limited number of touch well refreshes each time you play, making up for the fact that sometimes you just don’t get anything you can work with. And you also have a limited number of bombs that you can use to clear random sections of the drop well. Both of these are of limited value, but they can save you in a pinch. There are a few difficulty tiers to play with, but Fluxe is pretty much the same experience each time you play. Each screen you clear puts you in a worse position with junk lines rising faster and faster. It’s an ongoing puzzle that gets more and more difficult with each mistake you make. Every so often you’ll get the relief of a level break, but that’s just the way out of the frying pan and into the fire. You’re going to have to lose; the only question is when. Fluxe could be prettier, but don’t let that turn you off—it’s the brains that count in this game. It’s a cruel taskmaster, but that’s why it’s fun. 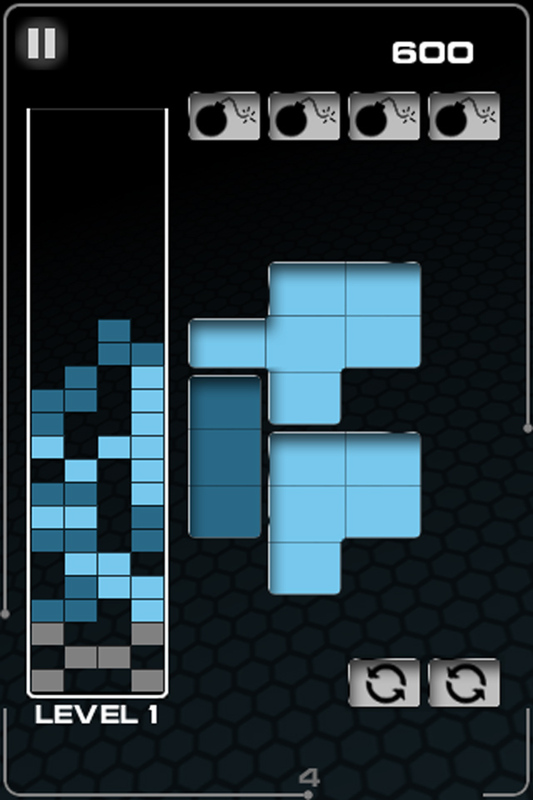 But me, I like a little more variety in my puzzle games. A slower-paced puzzle mode, maybe, or a faster cascade mode. If you’re okay with a single-note sort of game, Fluxe is clever and challenging, a great little twist on mechanics we’ve had drilled into our heads for years. FLUXE is an arcade/puzzle game that puts big twists on the falling-block genre!